There are a couple of ways you can connect to any Synology device; one is to simply head to the IP address of the device and login to the WebUI. If that is too straight forward you can use the Synology Assistant. This software will find any Synology devices on the network and allow you to connect with them through this interface even though you will still have a webUI to work with. 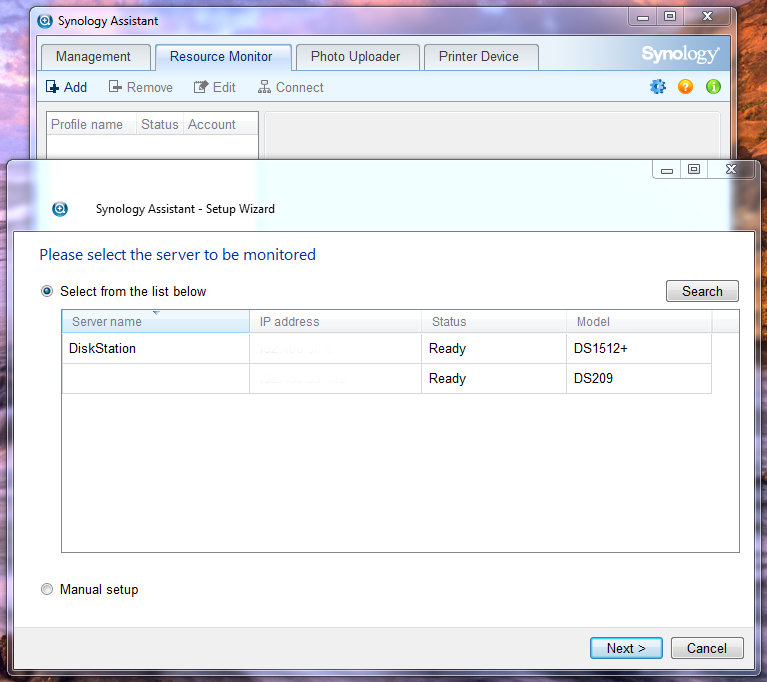 The Synology Assistant has more functions that just being able to access your DiskStation though. 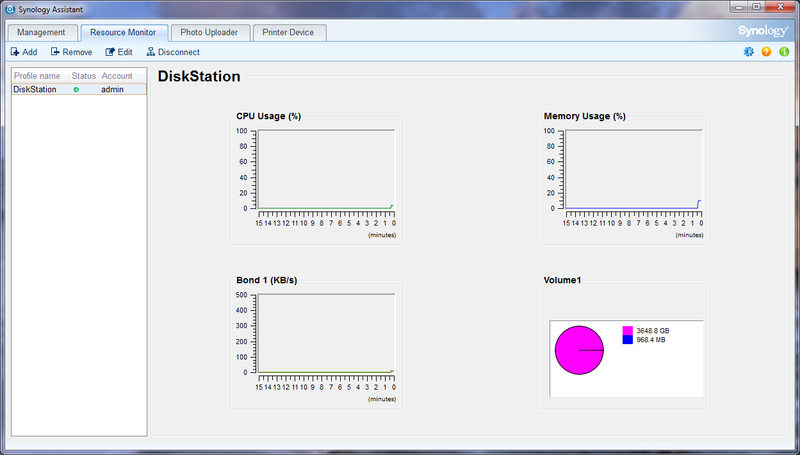 You can setup remote monitoring from your desktop and keep an eye on the health of your DiskStation very easily. Here you can see the CPU, Memory, network and volume performance at a glance. Synology also included a very simple photo uploader which can allow you to bulk upload images on your PC to the PhotoStation utility or to a pre-designated folder on your DiskStation. Synology has also included a nice utility that allows you to connect a USB printer to your DiskStation and use that like a Print Server. It is a pretty cool utility. One of the biggest things that sets NAS devices apart from each other is the WebUI and connectivity tools that are used to configure, secure and also monitor the device. 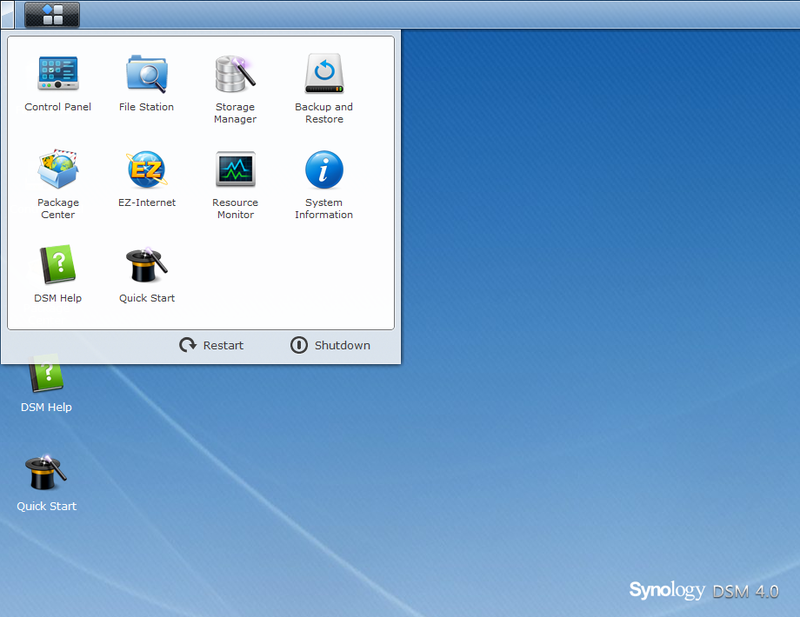 Synology has been perfecting their DiskStation software for some time now and have gotten things dialed in quite well. We have worked with multiple NAS devices and SANs (Storage Area Network) and out of them all Synology has one of the best WebUIs out. It is one of the more intuitive and fast webUIs we have tested. Once you are logged in the layout of the DiskSation WebUI (DiskStation Manager 4.0) looks a lot like a desktop with a wallpaper background, icons, and even a taskbar at the top. Starting off at the taskbar let’s take a look at what you can do. In the upper left-hand corner there is a small section of the taskbar that looks different. This is the “show desktop” button. Right next to it is the DSM “start” button. 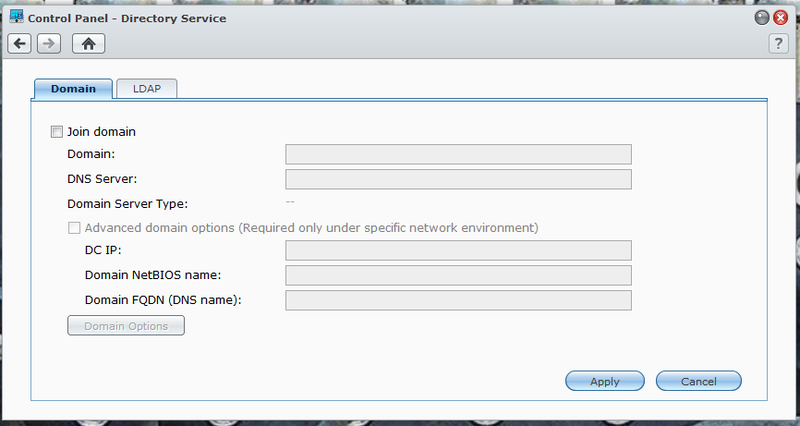 Clicking on this opens up a new window with that has some of your basic options for configuring your new DiskStation. 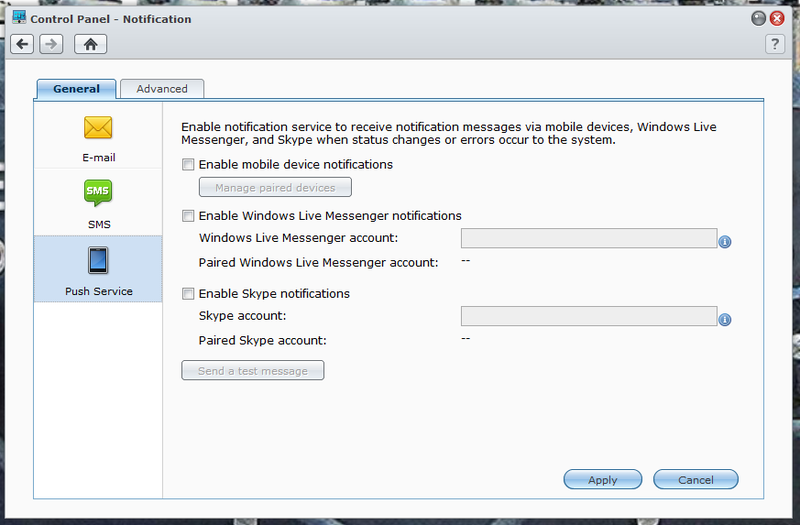 Now many of these options are already on the desktop as icons (just like in Windows or OSX). You can also drag these out onto the desktop for quick access. The start menu also has your shutdown and restart options here. Moving over to the right you have options to eject any external devices, look at any events logout and configure the current user, and of course search through the DSM. On the desktop (in addition to the icons is a widget that allows you to cycle between a few views. The default is system health but you have scheduled backups, resource monitor, current connections, file change log storage and recent logs. There are three sections in the widget and you can set each one to a different view so you are getting the most out of your time in the DSM. You can also minimize it if it is in your way. Now that we have gone through the meat of the desktop let’s look at the individual pieces that make up the DiskStation. In the File Station Window you can control the files that are on your DiskStation. 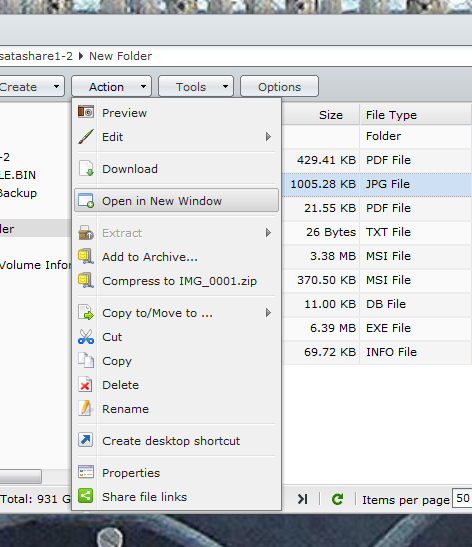 You have different options to create shared folders on the volumes available on the DiskStation or folders inside the shared folders. You can also upload data with two options; skip or overwrite. 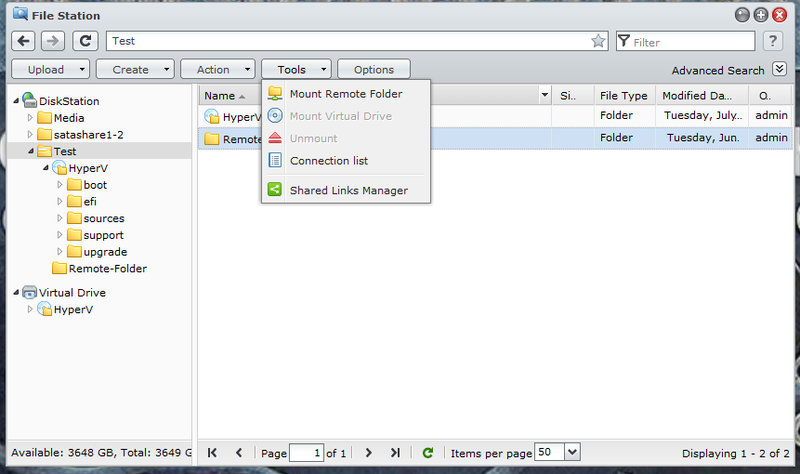 Creating shared folders is simple with easy to follow steps (including making the shares hidden or encrypted). You can choose the type of Access Control List you want to use (Windows or Local) and also if you want the folder indexed for fast searches. 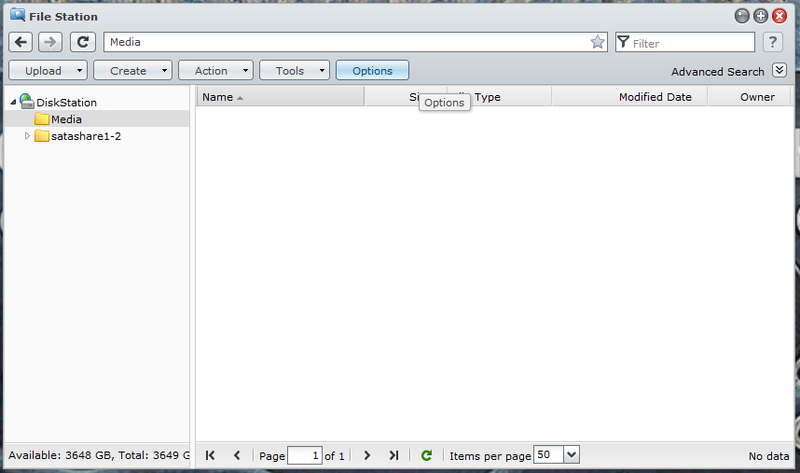 Once the folder is created you can adjust the privileges including being able to disable directory browsing. Another option lets you setup Network File System privileges which enables the NFS protocol on the share (this is great for Linux and also many Virtual host operating systems). The action menu is just that all of the actions you can perform on a specific file. 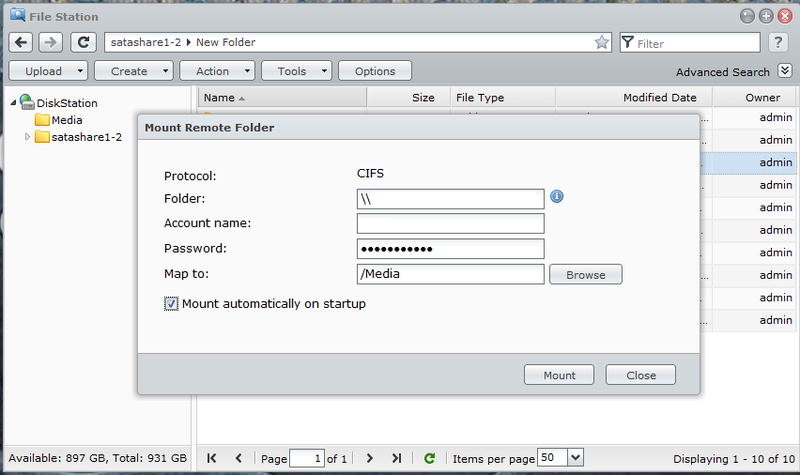 You also have some nice options to mount remote files (meaning you can use the File Station to connect to other folders on a different NAS device and share them through the single interface) you can mount .iso image files and share them out as well. It is a very cool utility to have and one that makes any DiskStation more than a simple NAS. 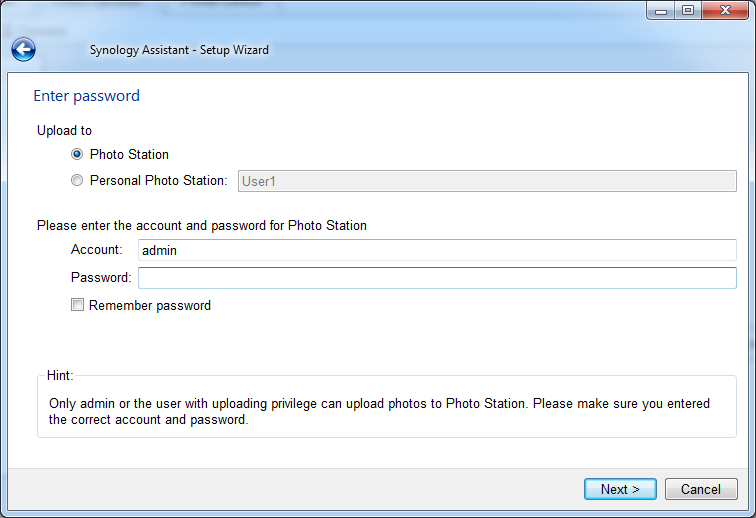 Clicking the options button brings up the security and logging options for the file station. Here you can decided who can share links, mount folders and ISO and also enable the log that will let you see who was doing what to the files on the file station. In this window we find all of the tools and utilities that make the DS1512+ so flexible. 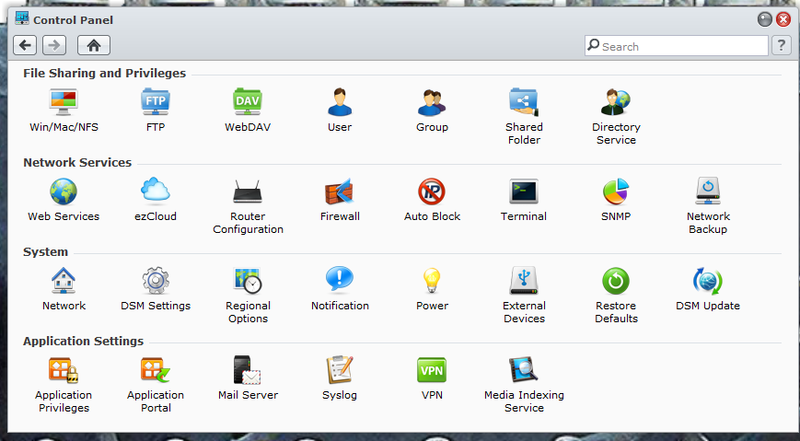 Synology has broken the control panel down into chunks (it looks a lot like OSX to be honest) to make it easier to navigate around. 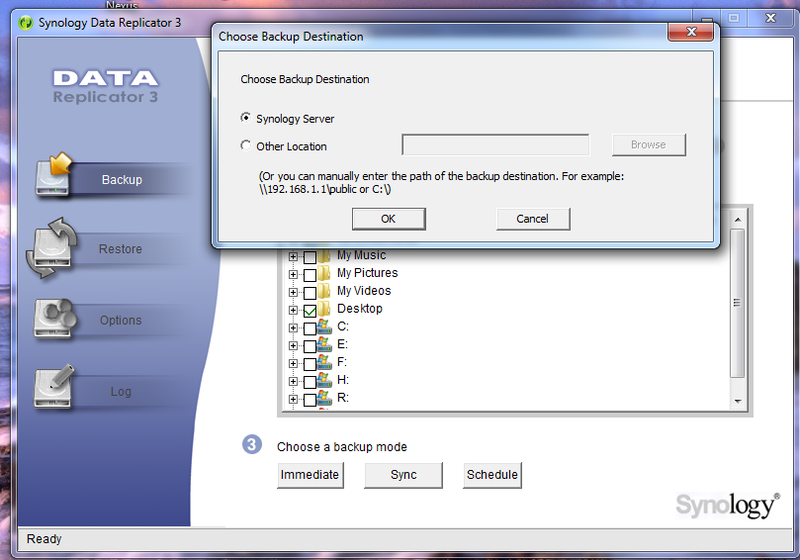 At the top of the window are the file sharing and privileges options. 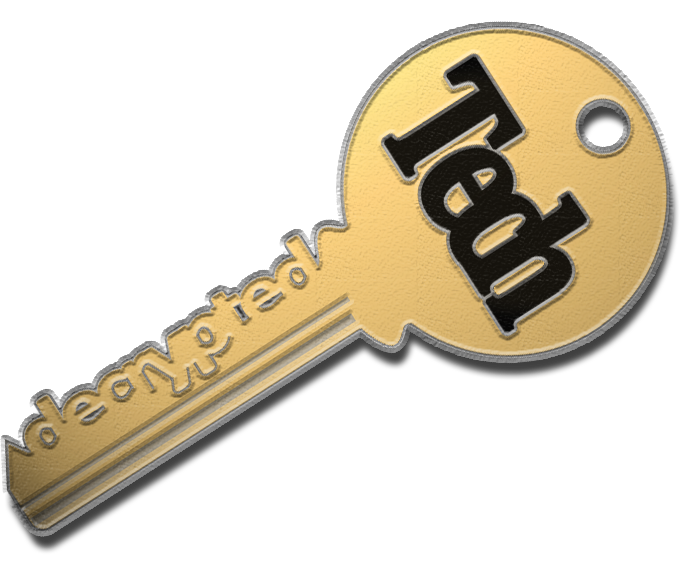 Here you can setup Windows, OSX, NFS, FTP, WebDAV shares and permissions. 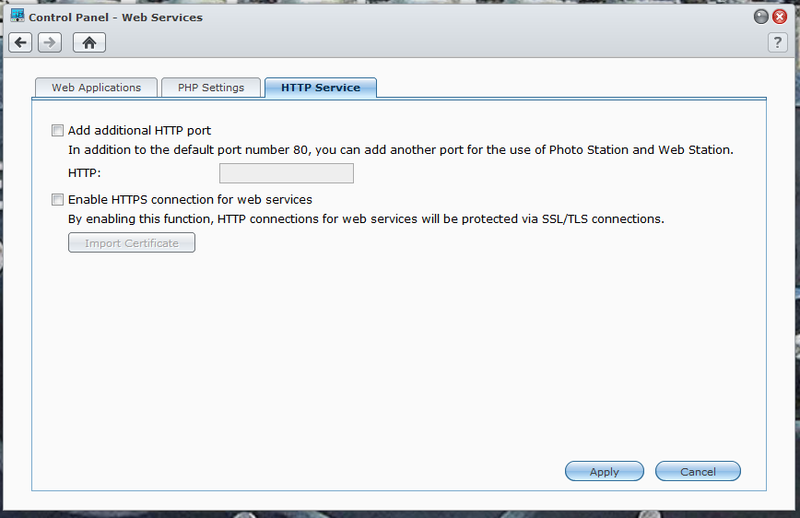 The FTP options are very nice as they allow you to force connections to use SSL/TLS for security. The user and groups options are self-explanatory so we will not get into them here; we have also already covered the options you have in the shared folder option. For Directory Service here are your options to connect to a Windows domain through active directory or the Lightweight directory access protocol. Moving down from there you have even more options, but these are for the network services. 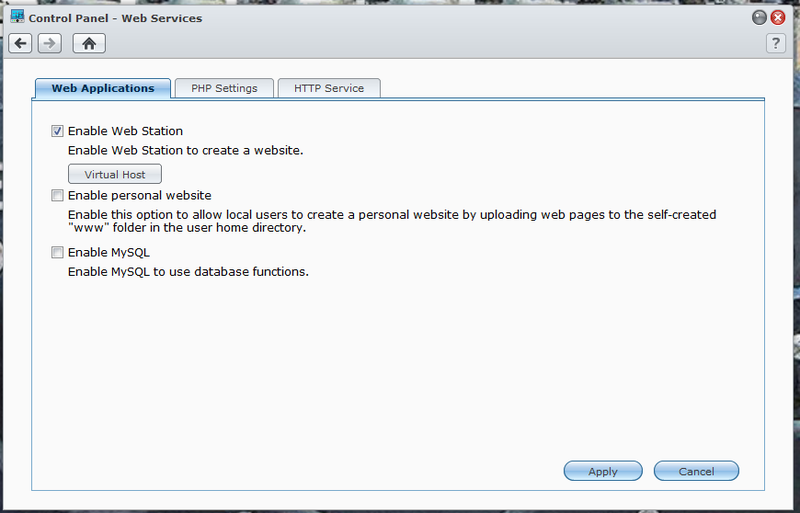 You can setup web services (yes it will become its own webserver). 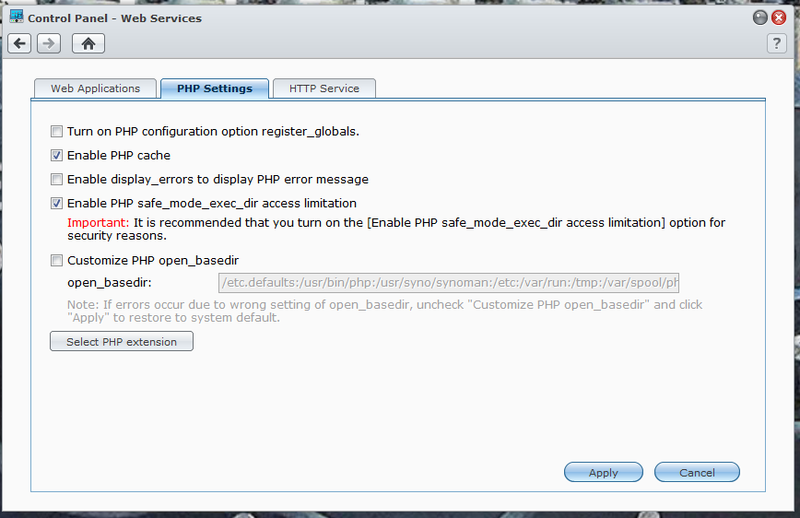 Here again you have some decent security options and can setup solid PHP security to protect your files and the DiskStation. 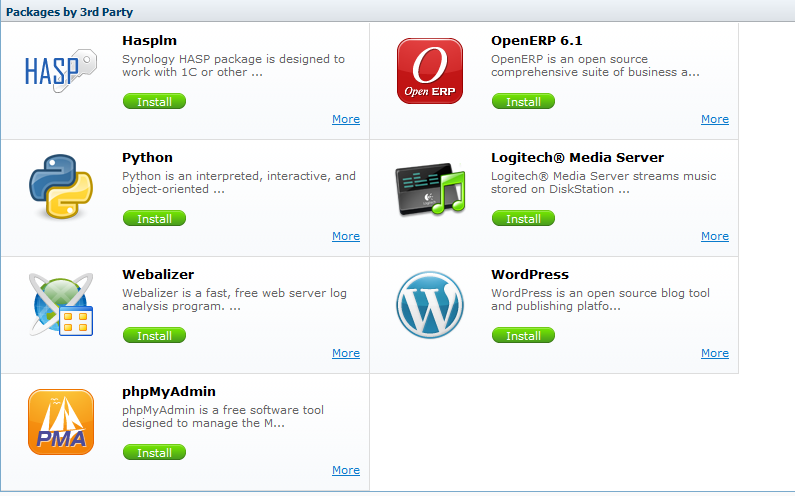 The ezCloud option lets you publish certain services to Synology’s ezCloud service for quick access via the internet. As part of the setup you can also register a dynamic DNS domain name with Synology to make connecting back to your DiskStation that much easier. 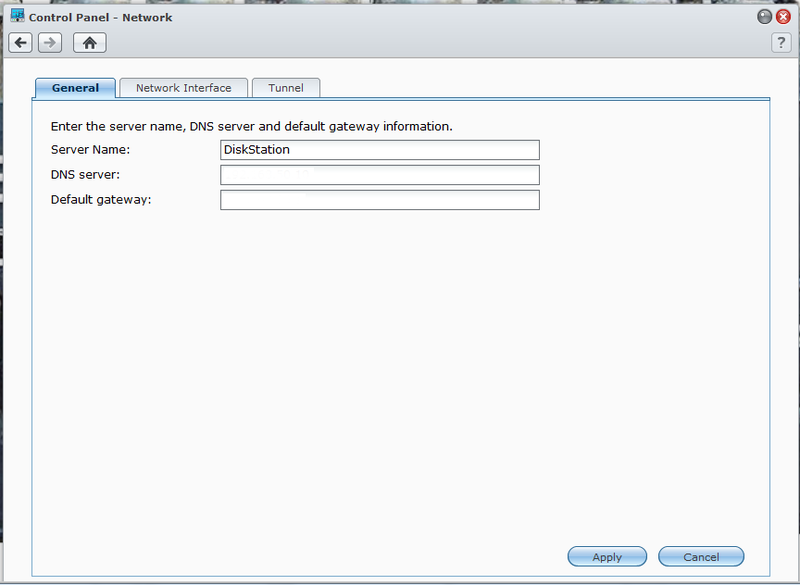 The DSM software also has a quick connect feature that allows you to easily setup paths to your data without the need to tinker in your router. 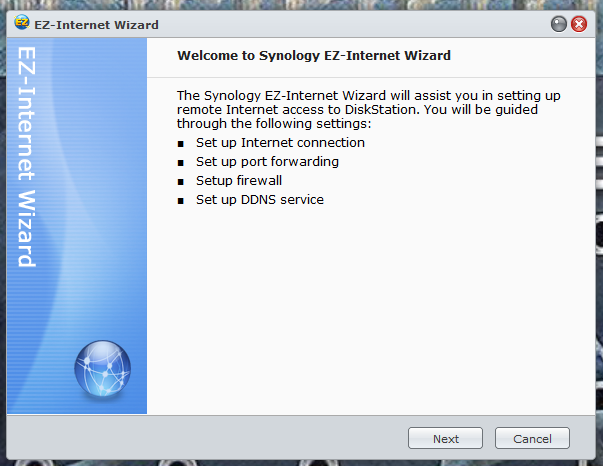 Synology does recommend that you setup port forwarding for best performance, but you do not have to with this service. Now, this means that your DiskStation can become your own personal cloud for file access and more. The router option allows you to control access to your DiskStation without needing to connect directly. Your particular router must be on the list to make the connection and to control the device. 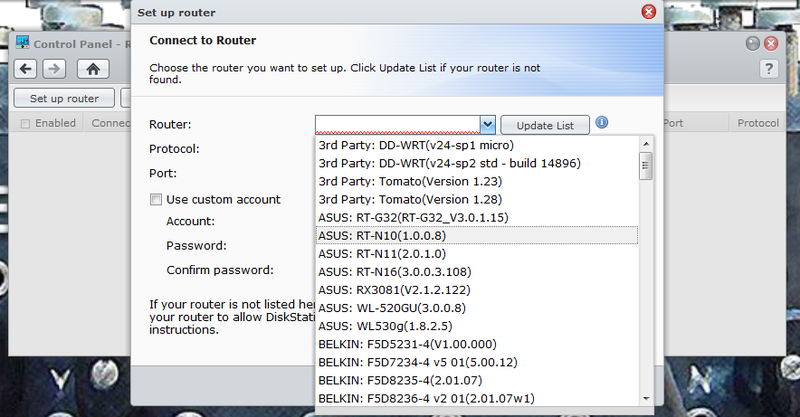 Our router was not listed as the list currently only includes residential products. 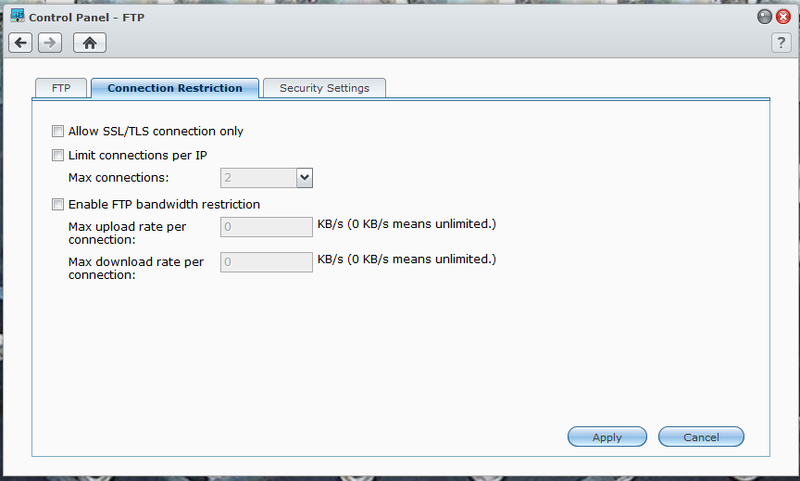 The firewall option gives you extra security for your DiskStation. 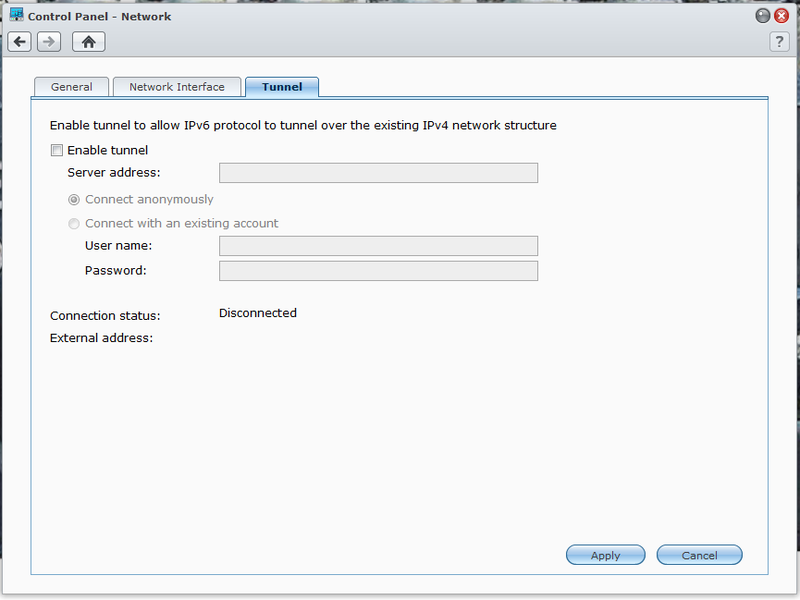 For example you could create a rule blocking a subset of IP addresses inside your network or a single host. You can also block access to certain ports all in the name of making things more secure for your data. For the really paranoid (or for anyone using the cloud features) you have an auto ban feature that will automatically ban access to the DiskStation by IP after too many failed login attempts. The next two options are for more advanced users and allow you direct terminal access to the DS1512+ via Telnet or SSH as well as setting up SNMP (Simple Network Management Protocol). The last item under networking is the backup system. 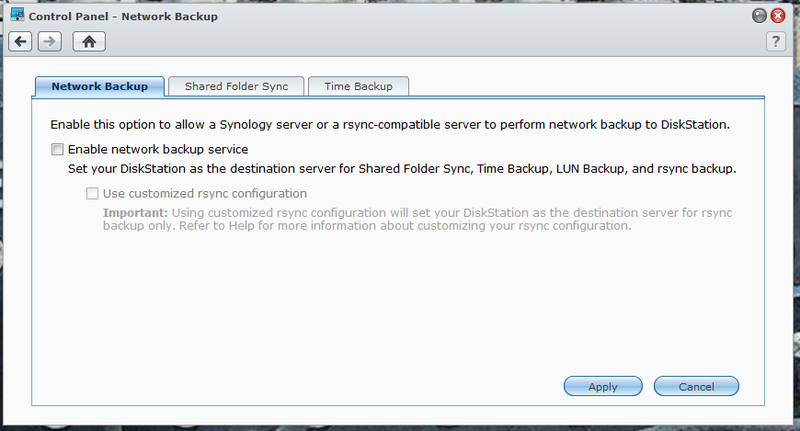 Here you can enable your Synology DiskStation to be the target for backing up other DiskStations or any other rsync-compatible server. With the time backup package you can perform timed “snapshots” of your data so you can go back to various points in time to see different version of a file. If you are worried more about the data on your desktop/laptop do not worry there is an app for that too. 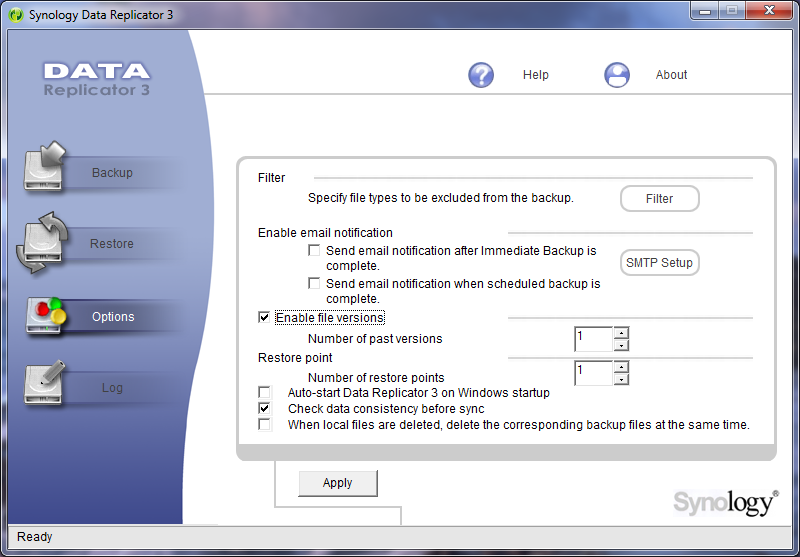 Synology has their free Data Replicator 3 software that allows you to setup a very granular backup plan for those too. For Macs you will be happy to know that your DiskStation has native support for Time Machine. You can turn this on when you enable the Mac File Service. The system options are just that. 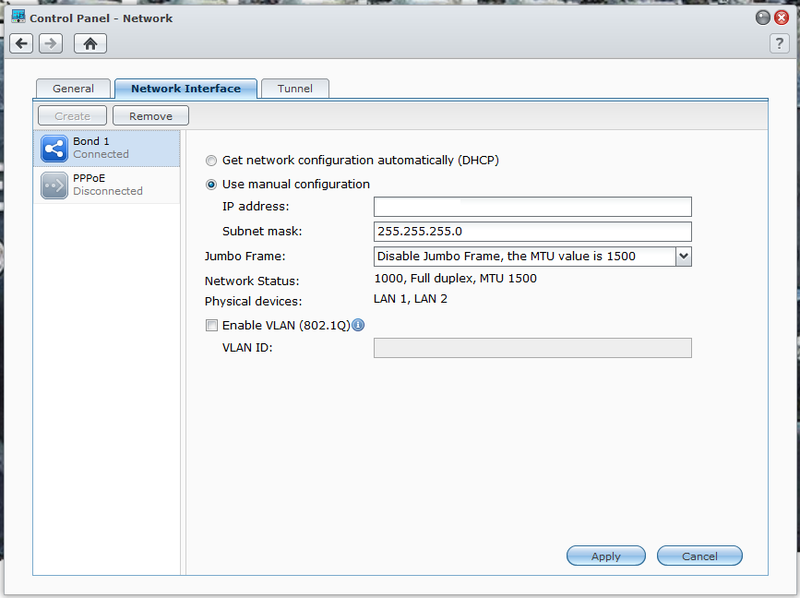 From left to right you have your entire network configuration including basic IP settings, teaming (including 802.11ad) and even an option to allow for IPV6 tunneling. Next up is the base settings for the DSM software including the style of the login screen, HTTP and HTTPS connection settings, the inactivity timeout and the port that you will use to access shared files through your router. Regional settings and notification are again easy to understand, we will add that Synology allows you to setup email, SMS, and direct push notifications which is a very nice touch. You can pretty much guess what is in power settings, you can control wake on LAN, HDD hibernation what to do after a power failure and even set times for the DS1512+ to power on and off. 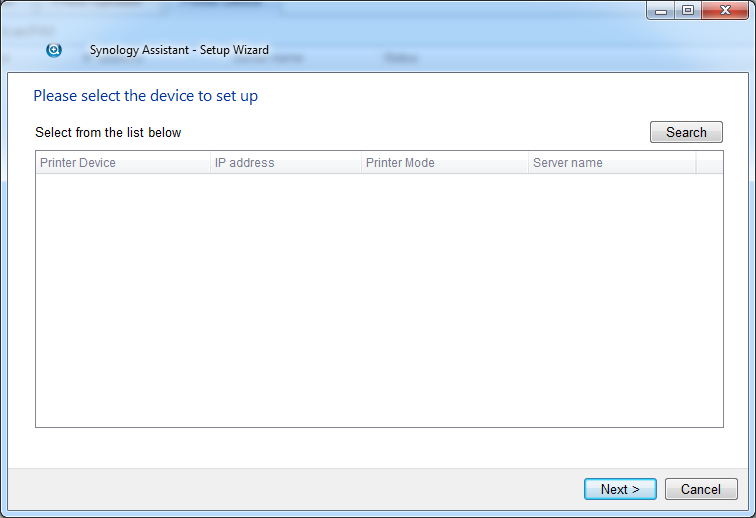 External Devices is just that, it will show you any external devices that are plugged into your DiskStation. 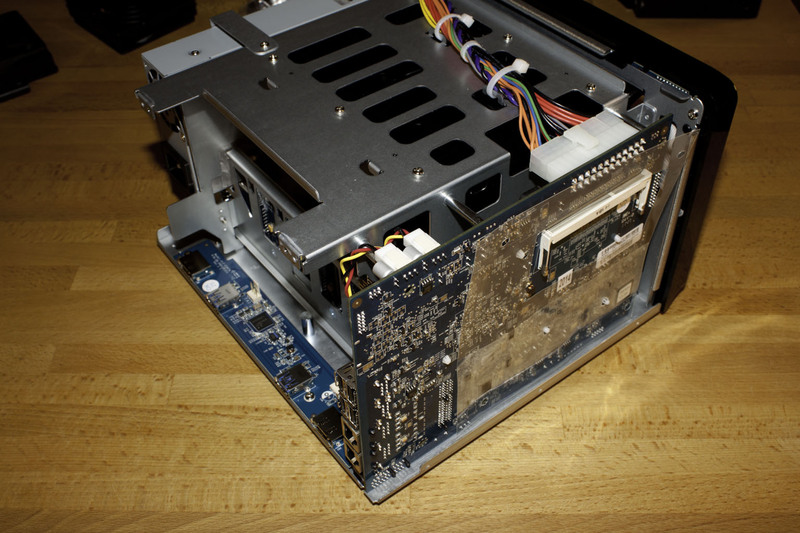 I our case we plugged in a Seagate Black Armor eSATA disk to see how it would work. We had no issues with this or any other external drive we plugged in including a USB 3.0 HDD dock From Termaltake. Restore Defaults and DSM update also do not need explanation. Synology hasa worked very hard to make sure that their products are not stuck in a rut. There is nothing exciting about storage to most people. However, if you make the device capable of working with multiple systems and give it the ability to add additional functionality then it becomes much more interesting to anyone looking at it. To make sure things are still secure you can setup different access for different people, if you do not want a user to have access to a certain application you can deny that right from the DSM. 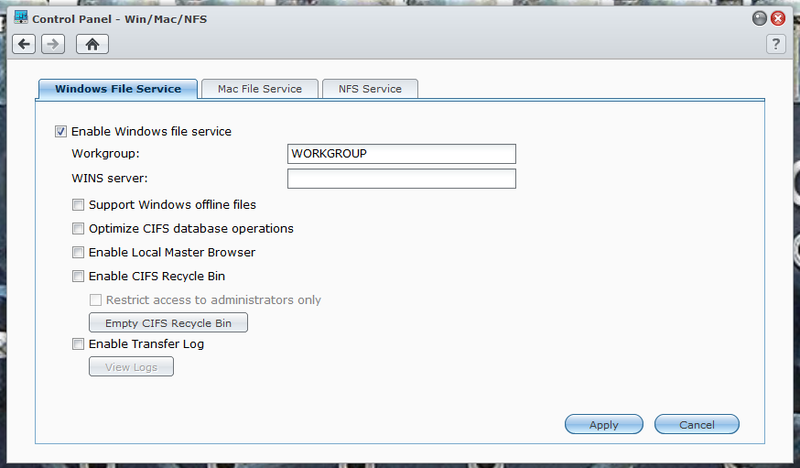 This includes both local and Windows Users and groups.The Application portal shows you the currently installed applications that are accessible to users directly (they do not have to log into the DiskStation Manager to get to it) the default is File Station, but you can add others. 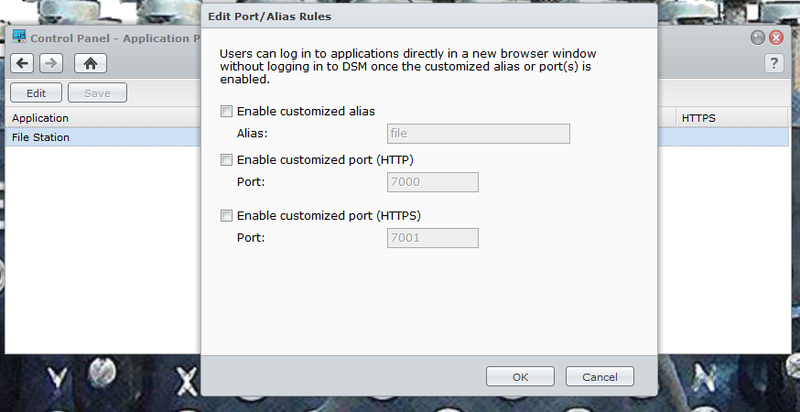 To get this working you will need to setup an alias and a port (either HTTP or HTTPS). 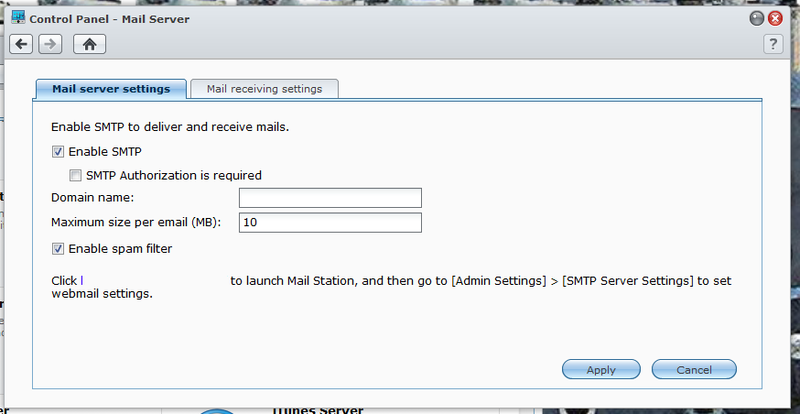 There is a mail station that is available for Synology owners. 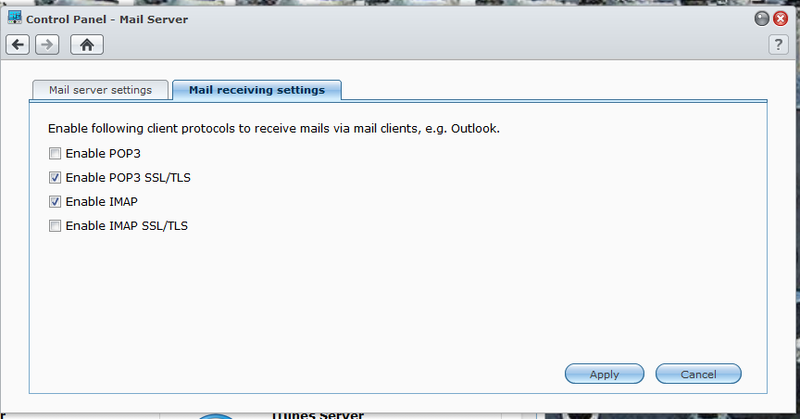 You can setup your DS1512+ as your own mail server. You will have to install a small package to do this, but once you do you can send and receive email through your DiskStation. If you are worried about running your own mail server you can keep your Gmail account and simply have the DiskStation pull those emails down for you and keep them on your own server, then you can send email through the DiskStation to make sure that you keep the majority of your data (you will still have to keep your Gmail account clean though). The Mail Station app uses the roundcube webmail service you also get spam protection built into the service which will help to keep some of the malware threats away. Syslog is what it says, but you will need a syslog server to send these logs to. Luckily there is a package for that in the package center which we will talk about in just a minute. 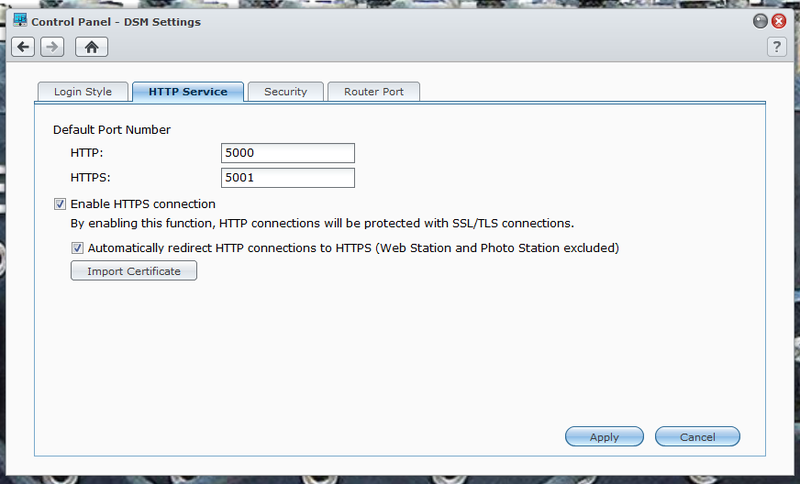 The VPN option allows you to create a VPN tunnel between the DS1512+ and another site. This is great for offsite backups to another server. You can have a secure tunnel over the internet while your data is transmitted. Media Indexing is, again, self-explanatory, but in this case there are some options that you would not normally find under Media Indexing. One of these is the conversion settings. You can set the quality of the thumbnails for pictures and also enable videos to show up in the photo Station when using a mobile device. 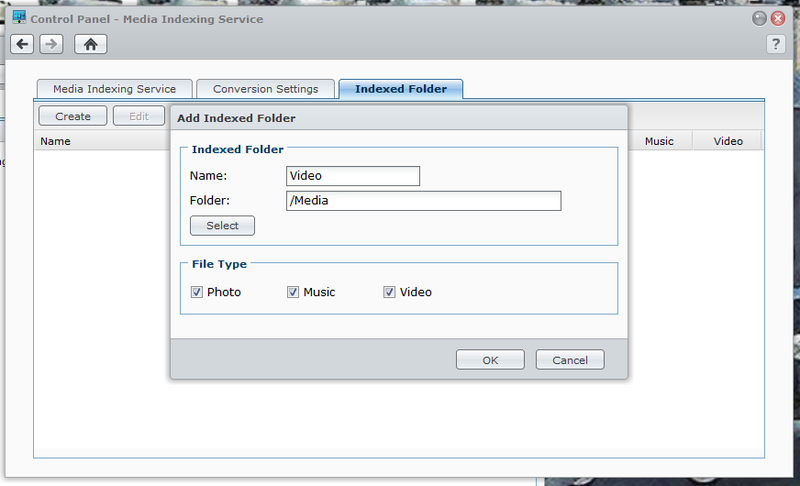 You can also create indexed folders straight from this menu and list them under a different name for the Photo Station. One of the advantages of the Synology System is that they have quite a few default packages available for you to install to your DiskStation. In addition to ones written and offered by Synology there is a pretty good third party eco system that you can extend the functionality of your DiskStation even farther including having your own CRM (Customer Relations Manager) software and even a WordPress Blog. Each of the applications keeps a log so you can see if there are any issue with them and quickly resolve them if there are, or forward the information to Synology Tech Support to address any issues that are too complex. For our testing we had the Antivirus Essential, Photo Station, Media Server, Time Backup and The Cloud Station Installed. Although we have covered almost everything there are still a couple of features that are left. One of these is the EZ-Internet Wizard. Again Synology is working to encompass consumers that are new to NAS products and ones that have been doing this for a while. The EZ-Internet Wizard allows you to quickly setup access ot your DiskStation from the internet so you can take advantage of the private cloud features that are available. The steps are simple and as we had everything already setup for this we did not run the wizard again. The Storage Manager is the root of the show. Without this piece of the puzzle there would be no need for anything else. 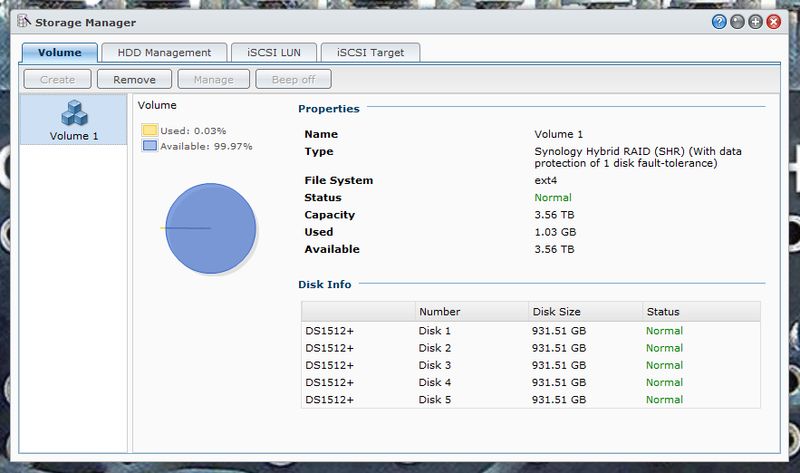 Here you can create and build volumes to share as well as check on the status of your disk drives. When we received our DS1512+ it arrived with 5 1TB Seagate drives for use in testing, as you can see in the HDD Management Window all are running as they should, with one drive running a little hotter than the rest. The default volume structure is Synology’s SHR (Synology Hybrid RAID) with a single drive for fault tolerance. 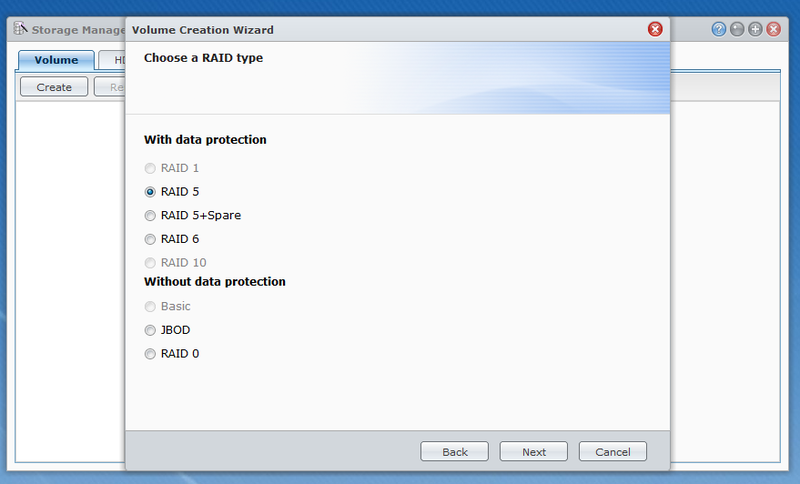 You can change this easily and have options for RIAD 1, 0, 5, 10 as well as drive spanning and JBOD (Just a Bunch of Drives) The SHR can also be configured to use two drives for fault tolerance if you are concerned about data redundancy. For those that are looking to get into virtualization you have full iSCSI support on the DS1512+ as well as (as we have already mentioned) NFS support. 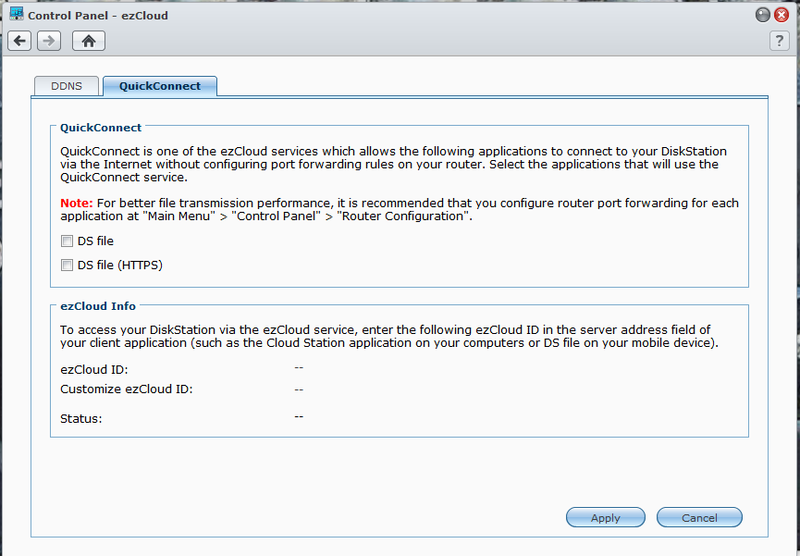 This will allow you multiple options for connecting your DS1512+ to your virtualization environment. For iSCSI connections you have some additional options for security and data integrity after you make your LUN (logical Unit Number). 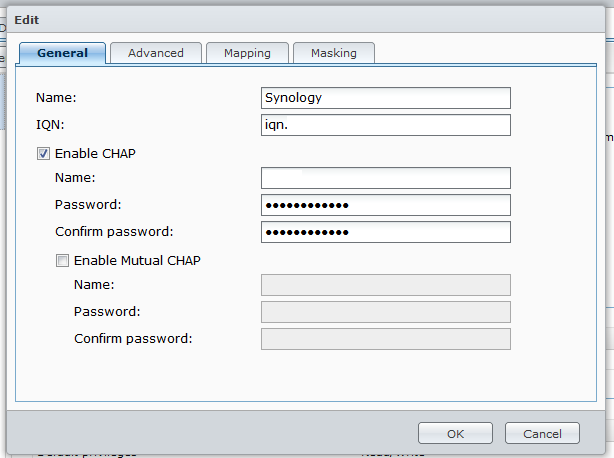 You can change the name of the target, the IQN (although we do not recommend that) and enable authentication through CHAP or Mutual CHAP. In CHAP (Challenge-Handshake Authentication Protocol) the connecting device authenticates with the target; in Mutual CHAP both authenticate each other, this is the most secure form of connection, but can also be a huge pain to manage. For added data security you can also enable the header and data digest CRC Checksums which will give you more assurance that your data is not being spoofed, but can also slowdown your system. 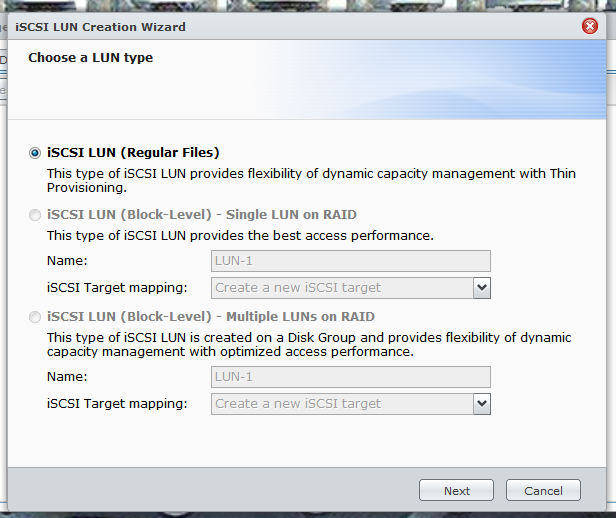 Mapping and masking are simple; mapping maps the iSCSI target to an existing LUN or LUNs and Masking is the base permission level assigned to the target. The Synology DS1512+ was tested as received with five Seagate 1TB drives setup in SHR with a single drive in fault tolerance. We also tested it with additional RAID types after the initial “ship” testing was completed. The follow on testing was raw performance and did not include many of the real-world tests we use. 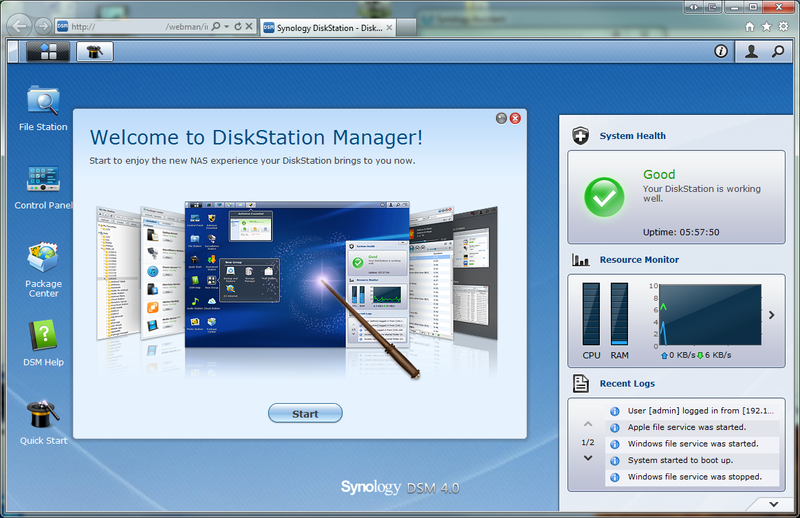 The version of DiskStation Manager installed was 4.0 (DSM 4.0-2197). We used VMWare’s vShpere 5.0 with two hosts and our usual 20+ guests for the VMotion Testing. 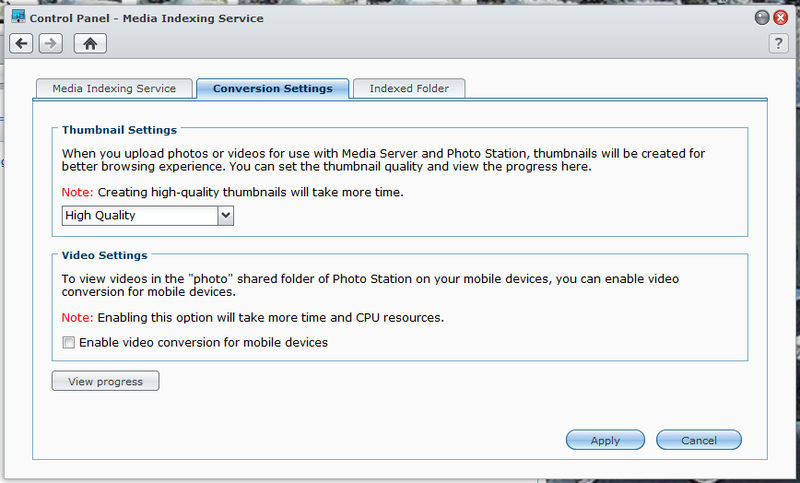 For all media and photo station testing we used a combination of AVI and Jpeg files that total about 24GB of data. These were accessed from various devices including Apple iPad and iPhone, Android Phones and Windows 7 PCs. The file transfer tests were accomplished using the same 24GB of files that we later used for our media streaming and access testing. For network connectivity we used the most bandwidth possible and teamed the two 1Gbe LAN Ports using LACP (Link Aggregation Control Protocol) this was connected to a a pair of ports on out NETGEAR GS110TP 8-port PoE Switch. The pair of ports was setup to allow for LACP traffic (and in particular 802.11ad) to pass through as if they were one port. We test things a little differently here at DecryptedTech, we try to combine repeatable data with real-world usage to give you a much broader picture of how the device will perform when you get it back home or in your office. Numbers like MB/s and IOPs are not going to matter if the device is not easy to use and does not meet your set of requirements. This is why we spend a lot of time with each product to see how it performs over time and during different events (like power loss, losing network connection etc). Each of the tests below are intended to give you a broad picture of how well the Synology DS1512+ performed under daily load, when maxed out and when trying to serve multiple requests. This test is a common test across the internet to find out the raw throughput of a Network Attached Storage device. To use this you have to setup a folder share on the device and allow the NASPT to read and write specific data back and forth to it. We ran this using all of the different RAID levels available to the 5-drive NAS. You can see the testing configuration and results below. As you can see from the results here the Synology DS1512+ with the five Seagate Drives does well at write functions, but still can handle the requests of multiple clients for reading files and folders. 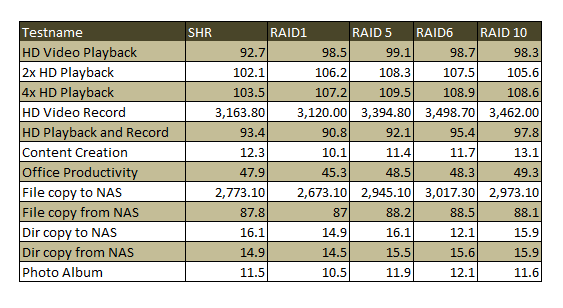 You best performance option for RAID is RAID 6 as it managed to have the fastest performance numbers in almost all of the tests run. Still looking across the board almost all of the RAID types perform well under the synthetic testing offered by the Intel NASPT. But as we always say, synthetic tests are only part of the story. Our testing with VMware has two parts to it. 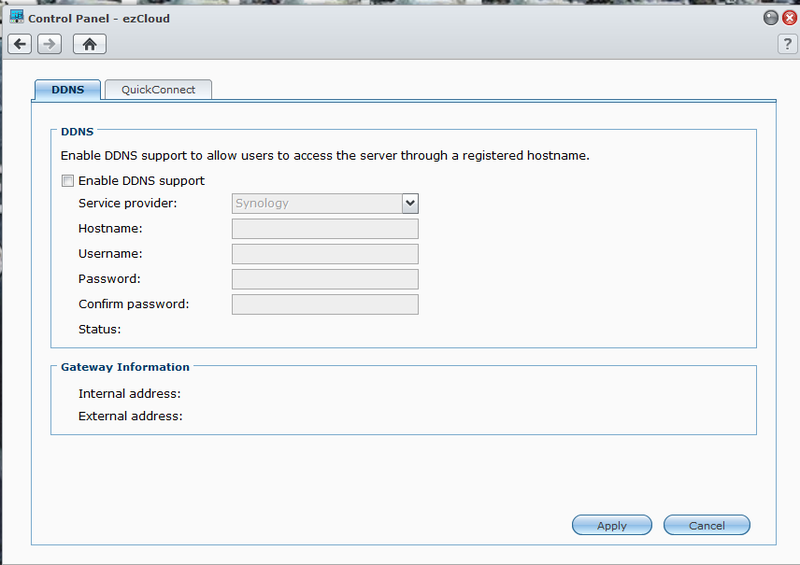 In the first we establish that we can create a new virtual system on the NAS using both iSCSI and NFS shares. From there we begin moving active servers back and forth between our two storage devices (the custom built NAS and the target or test NAS). We time how long it takes to move the servers between the devices and record the best times. All of the test servers (for movement) have the same size, thick provisioned with 120GB OS drives. We also have a final phase of the testing that we call “the plugs out” test. During this test we disconnect the NAS from the switch (disable the LAN ports on the switch) and then reconnect the system in normal usage the host should be able to reconnect to them without any data loss. If not then there is likely a problem with the way the system is buffering the information before writing to the drive. We were very impressed with the live move of servers we were able to move our 120GB test servers to the Synology DS1512+ in as little as 20 minutes. This is actually very fast considering they were thick provisioned (meaning they were taking up the full 120GB). Moving back to the Custom Built Storage Server was a little quicker with the fastest time coming in at around 18 minutes. As we mentioned before our file transfer testing involves a group of files (image and video files) that are around 24GB is total size. We send this to the target NAS and then copy them back over to see how quickly it can complete the task. We also send files back and forth to the target NAS during our streaming tests. The 24GB file group made the trip in about 30 minutes from our desktop to the DS1512+. The average transfer speed was around 12.7MB/s This is a nice transfer time and shows that the DS1512+ can handle large file transfers even with files that cannot be compressed like jpeg or AVI files. For our media streaming we use our Windows 7 HTPC system (attached via a 1Gbe connection as well as an android phone and an iPad to view the files using the Photo Station package. For the HTPC we used the standard windows share to stream the media to the device. Once again the Synology DS1512+ showed us that it is more than capable of handling the duties of serving multiple requests. We were able to view videos from all three devices without any stuttering. It also took a while for the Photo Station to pick up and index the videos that we uploaded to it (via the web page for that package). We did have an issue with the conversion as it reduced the quality of the video quite a bit when set to normal, but that is an application issue. We will cover the Photo Station software in another article as it is beyond the scope of this product review. The backup software that comes with the DS1512+ is nice and allows you to setup some pretty granular backups of your system(s). We were able to set this to a nice schedule and thanks to the option to enable a certain number of file versions we could go back in time to any point in the previous five days and see the version of that file. The backup of our local review folder (which has video, RAW, Jpeg and PNG files in addition to the word and excel files) took a little over 4 hours to backup using a low priority backup option. We also had the option to sync a folder with folders on our system so that we had identical copies of all of the files available. It is a nice option as more and more people operate with both a desktop and a laptop. Operation of the Package Center was seamless, fast and simple. We simply love this option and hope that it continues to grow. In fact the features here make the cost of the DS1512+ seem trivial in reality considering everything that you can get from it. It is not going to replace a real server in a business, but if you are a home user and are looking for more or a small business that is just getting started then the extras you get here in the package center are amazing. Each one has its own configurations page and settings that can be adjusted to suit your needs. 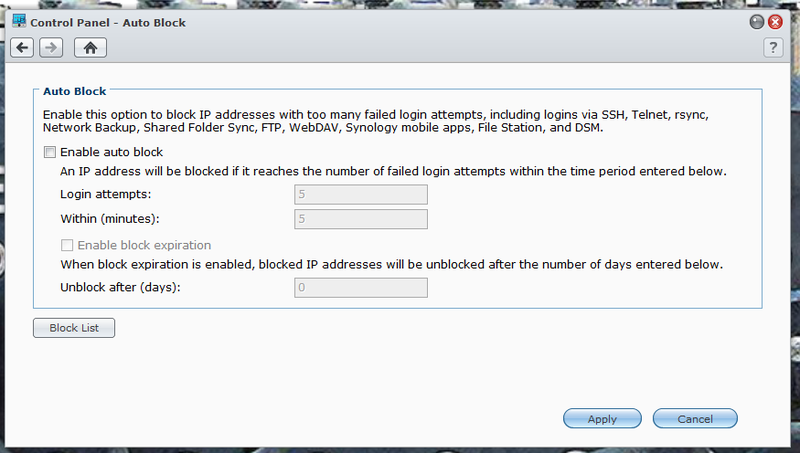 This is one part that Synology certainly got right. Value is another very subjective topic. What is expensive to some might be a deal to others. You can look at this topic in multiple ways. One is raw price and the other is what you get for the money. Each is accurate and both are correct ways to look at price/value. We tend to look at features, performance and real-property when we discuss value. However, we also take into account the raw cash cost of the item. The DS1512+ as reviewed will set you back about $1400.00. That is $840 for the DS1512+ and $500 for the five Seagate 1TB drives. This sounds like a lot and well it is a lot of money to fork over for a storage device. However, when you look at what you are getting here; large amount of storage, no need for additional licenses, email, backup, virus protection on files, VPN access, private cloud services it is something of a deal. For a home user $1400 is a little much, but for an enthusiast or small business it is not and the features, performance and everything Synology bundles into the DS1512+ make it a good investment. For those that feel the $1400 is too much many of these features are also available in their smaller NAS products so you are not locked out there. 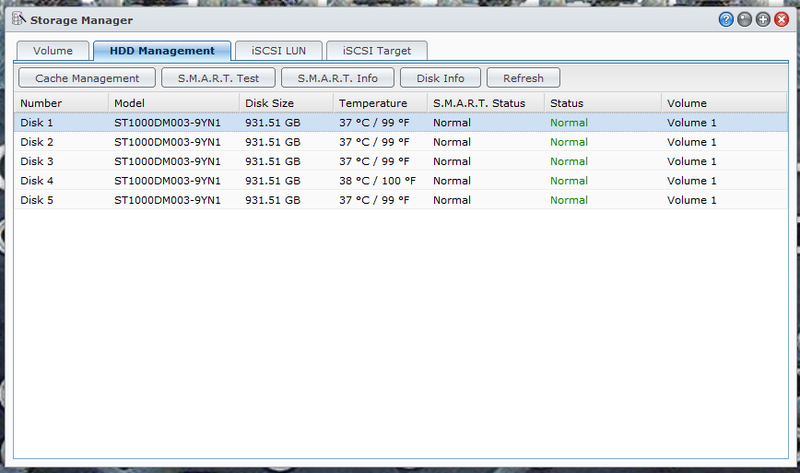 Testing the Synology DS1512+ took quite a while as we wanted to make sure we covered as much of the NAS as possible. As you can see from this article there is quite a bit to cover. Synology has packed a ton of features and flexibility into the DS1512+ in the form of their DiskStation software. We have worked with more than our share of NAS products and have to say that the DS1512+ is one of the best. You not only get excellent performance, but you have options for services that many other products cannot match (not that they do not try). We only wish that we could cover every option that you have with the DS1512+, but we simply did not have the time to get to them all. 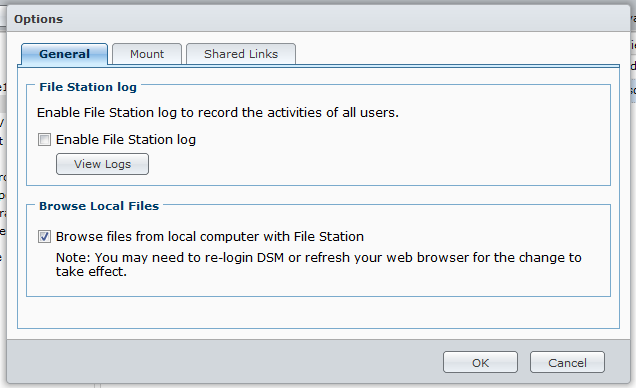 We do plan on taking a deeper look at the DiskStation Manager and some of the optional components in later articles. For now we can say that this five bay NAS from Synology is a very nice option for small businesses or even home users that have a need to store a lot of data (photographers, videographers etc.). With the added extra software and the ability to add additional trays for more storage space you simply cannot go wrong. With its combination of price, performance, flexibility and ease of use we are awarding the Synology DS1512+ our Gold Key Award.